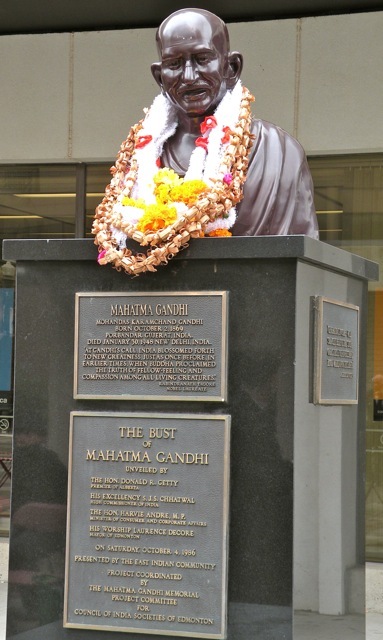 The Mahatma Gandhi Canadian Foundation for World Peace, based in Edmonton, Alberta, Canada, traces its origins to 1988 when observances of the anniversary of Gandhi's birth were so well received by the people of Edmonton that the initiators launched plans to enlarge the annual observances, to memorialize Gandhi, and to share his teachings through a national foundation. The Foundation has grown over the years and currently supports a summer program of graduate level courses for teachers at the University of Alberta; hosts an annual conference for youth on topics related to peace and social justice; and supports an annual event marking the International Day of Peace and Non-Violence each year on September 21st. Inspired by Gandhi's life and principles we envision a just and peaceful society. We promote peace and encourage nonviolent action based on Gandhian principles through education, public awareness, collaboration, and building intercultural understanding. BYLAWS: Interested parties can download a PDF copy of our current bylaws by clicking here. FUNDING: Occasionally, the Foundation provides funding for other projects that align with the Vision and Mission statements indicated above. For more information regarding the criteria for funding, download our detailed application form by clicking here. We welcome new members to the Foundation. To become a member or to become involved the Foundation in any capacity, please visit this page or contact us. Thank you for visiting.